You must know what distracts your concentration during namaz. For example if you are offering namaz at home, you might be disturbed from noise of children in street. 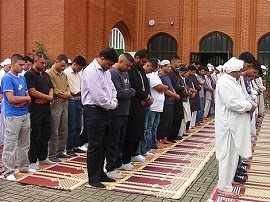 Try to offer namaz in a peaceful room and preference should always be given to nearest mosque. You must learn the meaning and translation of what you are in namaz. For example if you are urdu speaking muslim, you should know urdu translation and meaning of words that you recite in namaz. Knowing translation of namaz in urdu will help you in improving concentration during prayers. No matter how much hard time you are facing in your life, always remember that when you are offering salah, you are in direct connection with almighty Allah. So forget your miseries and hardships and put all your concentration on Namaz. Make this thing very clear in your mind that you are praying to Allah almighty and only for his sake. Always remember your death. This may be your last namaz. So pray as if it is your last chance to get eternal happiness after death. Stay focused and put all your concentration on namaz. The most important and foremost point is 'fear' of Almighty Allah, like it could be your last Namaaz so make it worthy to save you. Always make your prayer area neat and clean. Perform Wadhu as it is described in Sunnah. Untidy and not-cleaned prayer area will always distract you.